Now in its 18th year, the conference featured member speakers Gold Road Resources Exploration Manager Julian Woodcock, Saturn Metals Limited Managing Director Ian Bamborough; Impact Minerals Managing Director Dr. Michael Jones; Westgold Resources Managing Director Peter Cook; Independence Group NL General Manager Exploration Ian Sandl; and Ramelius Resources General Manager Exploration Kevin Seymour. 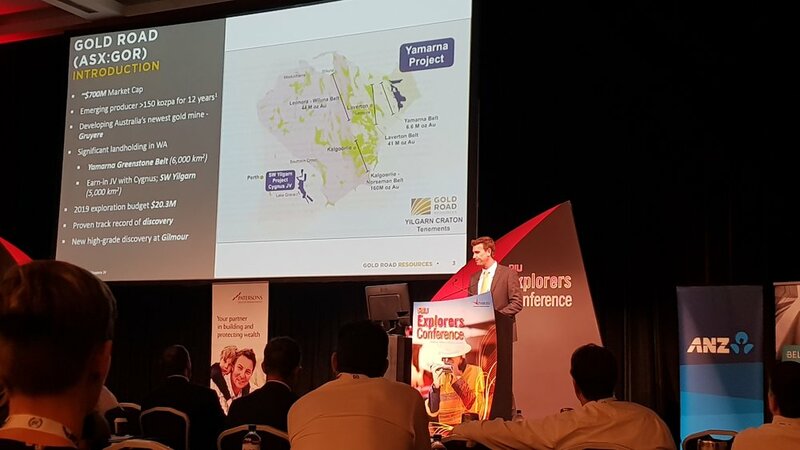 Gold Road Resources Exploration Manager Julian Woodcock provided an update on the company’s Gruyere Joint Venture with Gold Fields - now at 93% completion. He also spoke of the new Gilmour project, along with other exploration plans for 2019 along the Yamarna Belt. “It gives us great potential to continue to grow as a company,” Julian said. Saturn Metals Limited Managing Director Ian Bamborough said their work at the company’s Apollo Hill Project in Western Australia had the potential to become a multi-million-ounce gold project with expansion drilling now underway. “It’s a very healthy resource and growing resource at the heart of our land package, with an underexplored and completely unexplored land package around it,” Ian said. Impact Minerals Managing Director Dr. Michael Jones said they plan to reinvent themselves as a modest producer by the end of 2019 with their Blackridge Gold Project in central Queensland. The ‘main game’ for Westgold Resources is the Murchison area said Managing Director Peter Cook. Drawing a huge crowd, he explained the Murchison gold operations’ success is largely due to the three processing plants within its borders operating at full capacity and four key underground mines. “The southern part of this, from Meekatharra to Cue, is possibly the largest aggregation in play this industry’s seen, since Alan Bond put the Super Pit together,” Peter said. Independence Group General Manager Exploration Ian Sandl, said the biggest key to their success is having the right people and the right workplace culture, with the company investing across its entire team. “IGO is strongly committed to exploration as a primary driver of growth, through new mineral discoveries. We are committed to exploring around our mine assets to extend mine life,” Ian said. Mount Magnet is 'the backbone' of Ramelius Resources operations said General Manager Exploration Kevin Seymour. “It’s still delivering with two bonanza grade shoots and exceeding its original expected mine life by over seven years,” Kevin said. Supported by Gold Road Resources, AGR and the WA Mining Club, the conference has already earned a reputation as the major Australian forum for the junior resources sector, with mineral exploration companies and emerging new miners attracting an ever-growing group of brokers, fund managers and investors to hear their presentations. This year’s Craig Oliver Award was won by Julian Hanna and the team at Mod Resources. READ MORE MEMBER AND INVESTMENT NEWS.